Do you remember making pompom animals when you were young? Maybe you've never stopped making them. 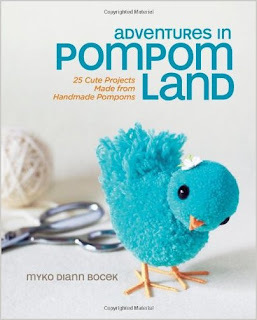 That would put you squarely in the same camp with Myko Diann Bocek, who has written Adventures in Pompom Land. Warning: this is a book full of cuteness overload! Would you like to win a copy of Adventures in Pompom Land? Just leave me a comment below and you'll automatically be entered to win. If you tweet or post on Facebook or other social spots about the contest, you can leave a second comment and be entered twice! Please make sure that your link will lead me to an email address, or else I won't be able to contact you. No contact, no win, and I simply have to go on to the next person. Deadline: March 27, 2013. OMG! How cute is this?! Love it! I remember making pom pom animals! These are so cute. 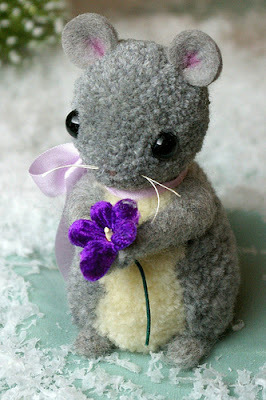 Oh, the squirrel is adorable. I would love a copy of this book. Thank you, Cyndi. They barely look like pom poms! this looks like such a fun book, how cute is that little squirrel! Absolutely adorable creatures! Thanks for the opportunity to win the book - it would be awesome to try some cute crafts!